Uncertainty is a terrifying nightmare from which there is no escape. Many people are still uncertain every day of where their food will come from. What happens if the crops don’t grow? Will the bomb drop? Will the government ruin all of our lives? Will they love me back? The possibility space for reality is immense, and we dedicate much of our lives to reducing uncertainty. We try to get stable incomes. We join communities and support groups. We affix our lives with familiar routines. But even the most well-laid plans can go wrong. How do we deal with this madness? Our bodies and brains have learned to cope with it. Humor is largely about uncertainty and surprise. The Hitchcockian bomb under the table creates entertaining suspense. We trick our bodies to think that something has gone terribly wrong when we go on roller coasters, just for the thrill of it. We also play games, where uncertainty is a primary characteristic, according to Greg Costikyan. His book, “Uncertainty In Games” is one of the finest I’ve had the privilege to read on the subject of games. Its 100 or so pages are densely packed with, primarily, an effort to categorize different types of uncertainty we see in games. Bookending this are broader arguments about what games are and advice for designers in how to best utilize different areas of uncertainty. The second chapter is a mere 5 pages but it’s an absolute gem, advancing an argument that games are merely play developed into culture. While we may rely on our animal minds to play ad hoc as small children, as we develop advanced reason and language–two fundamental traits that separate us from other animals–we create rules and systems of play. For lack of a better word, we enculture our play. In doing so we create a culture based on dealing with uncertainty in a safe environment, so to better be able to handle the uncertainty if the unsafe environments of the “real world”. 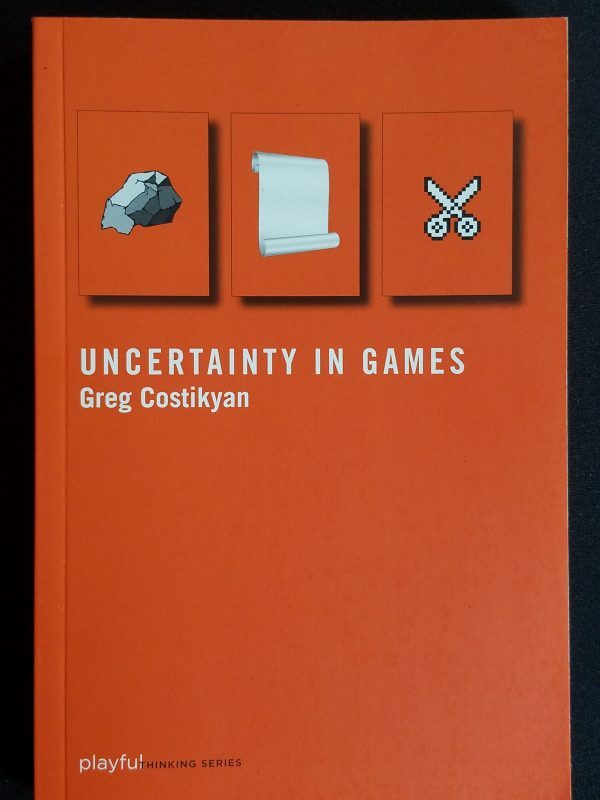 The bulk of the book is split into two parts: quick analyses of a number of games in order to dissect where and how they create uncertainty, and more detail on each type of uncertainty discovered. Reading through this is a delight, as Costikyan draws from a wealth of experience in the games industry to look at familiar games in ways that sometimes surprised me. I never expected I’d read a book that compares Chess to Roller Coaster Tycoon, but here we are. The key takeaway is that uncertainty isn’t contained to only randomness–in fact, randomness is merely one of the many types of uncertainty Costikyan talks about. Of equal, or perhaps greater importance are things like performative uncertainty or analytical complexity. Or what about the uncertainty inherent in any multiplayer game? You may have a good idea of what someone else will do at a given time, but you can’t always be sure, and the suspense from not knowing what another person will do is arguably more interesting than the suspense caused by a roll of the die or a card draw. There are a few examples at the end that serve as case studies of games that have too much, too little, or the wrong mixture of uncertainty, but those looking for a guide on how to fix their game design aren’t going to find a direct resource here. Costikyan isn’t trying to examine how to fix common design problems or write a “how to design a game” guide. Rather, he’s given us a simple classification guide for uncertainty. Nothing here is groundbreaking or revolutionary. As I read through the book I nodded along as I read through ideas and concepts I knew, but hadn’t understood so clearly before. There’s something to be said for books that take concepts you already know intuitively and precisely elucidate them. “Uncertainty In Games” is that kind of book, and I love it. I look forward to revisiting it periodically, seeing what new insights I can find, remembering what I’d forgotten since the last read. I can already imagine the edges getting worn, the pages filling with underlines and notes. It’s a honing rod for the game designer’s mind.